I have had my REL STORM for going on 16 or so years i bought it used from a high end shop here. This is a solid piece of equipment, the sound is amazing it adds to your music not overwhelm it with "BOOM".I have mine paired with the b&w cdm 9 series of speakers. It is a natural for anyone looking for a musical supplement of some depth to there system. I purchased this sub because of a review I read in Stereophile Guide to Home Theater and discussions with Stirling Trayle (Sumiko, the importer for REL). He helped me match a sub for my Vandersteen 3A's; 75% music, 25% movies. The review was actually one of the REL's lower models geared more for home theater rather than music only. But Stirling guided me to the Storm model instead. I did not hear this unit before it arrived via UPS (no local dealers). The Storm is a fantastic product. It blends so well with my Vandersteen's that it as if the sub is not even there. Music (classical in particular) exudes a great weight that I had never experienced in my system before. Even with piano, it adds something...noticeable when the sub is switched off. The hookup on the REL may be a bit unique. Instead of filtering the low frequencies to the main speakers, and thereby reducing the workload of the amplifier, it connects to the amplifier's speaker outputs directly (resistance of this connection is said to be about 10,000 ohms). This is the high-level connection. There is also a low-level connection using two RCA plugs and this can be attached to a pre/processor for additional flexibility. The limitation in this scheme is that filter settings affect both the high-level and low-level inputs; they cannot be set individually. Ideally, for home theater, the ".1" channel should not be filtered while the high-level should be. The new models have this feature. It is recommended the sub be placed in a corner and that is where mine is. Setup took about an hour, with minor tweaking of the settings thereafter. The filter is set to the 30 Hz position for music. When using it for movies (5.1 only) I disconnect the high-level connector and reset the filter to it's highest setting, 100 Hz. By doing this, the entire ".1" signal is accepted by the sub. For music, I connect the high-level and set the pre/processor to NO SUBWOOFER. This is a minor inconvenience, but the results are worth it. The subwoofer is well behaved; it sits in the corner and does its job. Don't let the power rating of 100 watts and a single 10 inch driver fool you, it has more power than I can use (or would want to). 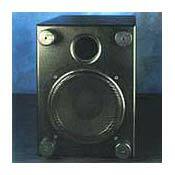 The only other subwoofer I auditioned was the Sunfire (standard and sig). I'll just say it didn't work out for me. The Storm's sound is deep, clear and fast. The Vandersteen 3A bass tends to be a little more "loosely" delivered. In the CD Holst The Planets, the organ size and depth is incredible. In movies like Contact, The Matrix and Saving Private Ryan, the room shakes quite a bit; scary at times. Overall, this is a fine product and one I would buy again. I'm now looking at upgrade options to the REL Stadium III. To me, the Storm is a great value used at $1000 or under; especially if you are more interested in music than movies. I have used this sub for 3 years now, in a stereo set up, and have never regretted my purchase. I go to my friends houses, listen to their overpowering, boomy, unclear subs that don't blend, and I just smile. As far as quality, there is just no comparison-Rel wins. This sub becomes transparent and adds as more bass than my B&W front speakers (playing at 150watts/side) can keep up with. I am anxious to upgrade my amp, which will add a cleaner more powerful sound to my front speakers, just to see if I can finally turn the Rel up and enjoy its full capacity. I've had this sub for over 2 1/2 years now. It has and probably always will be one of my favorite pieces in my audio system (and it is nowhere near the most expensive). When I started my exhaustive search for a Sub, I tried all of the brands listed above. Some seemed like they just didn't put out enough sound, other felt like they were just not that clear. I really was looking for a large diameter subwoofer thinking that bigger is better. I was wrong. I had the fortune to compare the REL to Velodyne's top of the line 15" at that time (that was what I was probably going to get) and my jaw dropped. When I heard what bass is SUPPOSED to sound like, the velodyne sounded like it was producing nothing but mud. The Storm was fast, clean and blended in so well with my system, I would turn the sub off from time to time to make sure that it was creating all that beautiful bass and not my towers. About a year ago, I upgraded the stock interconnect with Audioquest Ruby. With that, everything wonderful about the storm just doubled. The bass got even tighter, everything was clearer and the bass strengthened. If you don't know what fast bass is, you will. Just pop in any movie with machine guns and your jaw will drop. Instead of just a long droning bass that most subs put out, each and every bullet was felt and heard through this sub. I highly reccomend this sub to anyone who wants more than just a big "boom". This is not a sub that you would find in the rattling car next to you at the stoplight, this sub actually reproduces the sound. Drums sound like drums, explosions go deep and take your breath away. Anyone who has passed up the REL because of it's 10"woofer has made a terrible mistake. I've yet to hear a sub of any size put out as much clean powerful bass as the REL. I give it 4 stars just because there are higher end REL's out there. Matched with Marantz PM-17 and KEF RDM twos. More bottom than I will ever need. High-level connection to speaker terminals on amp, integrates well with KEFs. This is the only sub-woofer I have ever got decent results out of - after trying some Velodynes, Mirages, and M&Ks. With every other sub-woofer I spent hours trying to dial them in and got so frustrated that I returned them within a couple of days. But with the REL Storm - I put it in a corner behind the speakers, set the cross-over at its lowest point, and then played with the sub-woofer level until everything fell into place (about 11 o'clock on the dial as it happens) - all in a matter of an hour. It is the only REL I have tried so I cannot comment about whether this is the one to get, but the Storm worked very well for me and was always very musical. At the price it deserves 5 stars. This is a rather large (23"x16.5"x12.5") subwoofer from a British company that also makes the Strata, Stadium, Stentor and others. It uses one 10" Volt driver and a 100 watt mosfet amplifier. It has a pair each of high level, balanced, and single ended inputs. There is no provision for sending the signal back to your amp after the input from the preamp (the Strata has that, but that one is slightly smaller and less powerful). The high level (speaker level) input is the recommended method of hooking it up, so that the sub takes on the character of the main system's amp. It comes with a 30' wire to run from your amp's speaker teminals to the special connector on the back panel of the sub. There are three knobs, one each for rough and fine cutoff (4 positions each - 16 possible in total), and one for level. The cutoff positions run from 30 Hz to 120 Hz in 3-12 Hz increments, the lower the frequency, the finer the increments. This is a very good feature, unusual for a sub to cut itself out so low...this is designed as a true subwoofer. This sub has widened the soundstage and increased presence in my rather small room. My main speakers are Morel Acoustics floorstanders. I am able to dial the sub in so that there is extra presence without boominess. I find it difficult to go back to the sound without it, in fact. Especially with symphonic music, but also with jazz. I did not do any particular listening comparisons in-home, but I did like the hookup methods involved and was looking for an 'audiophile' sub rather that a boombox. Very pleased overall. One note: I find that the price is a bit high considering that there a bigger and more powerful drivers out there (from N. American makes) for this price, like the Paradigm. However, this one does the job nicely and the sound is impeccable. 4 for price, 4.5 for sound. Deep, articulate and high detailed bass response. Integrates well with any speaker system due to high quality and very well engineered crossover system and driver. Very well built. This sub is capable of producing very deep, but more importantly, well defined/articulate bass response. Most importantly, it can integrate, in a seamless fashion, with any speaker system due to the high quality and well engineered crossover network and driver. It does take some time to "tweek" the crossover to integrate with a speaker system, but it is fun and the results are worth the wait! Once set up properly, you cannot determine where the bass is being produced - the highest accolade a sub can attain!! I had it up and running,in less than half an hour. I need to hear it more, so i can adjust it better. A truly outstanding product. There aren't many organisations like REL around anymore, make one specific component superbly in a range of guises. A very informative Website, superb customer support helpline and a three year warranty, that's confidence. Nothing more to say other than "GET ONE".